I’ve often thought about doing graphic design or just something where my art would be put on display and hundreds of people will see, use and even enjoy. It was some time during the Fall 2015 semester when I decided to take a chance and apply to be one of the graphic designers for the Askew Student Life Center. 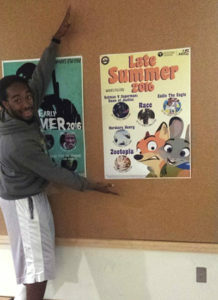 Ever since I came on campus I wanted to be a part of the team that created the movie schedule, posters and buttons that students love and collect. One of the most challenging parts of the process was creating a mock flyer, I was definitely nervous about making an 8.5×11 inch creative draft. After I received the internship and went to my first meeting in early January, I absolutely enjoyed the fun and creative atmosphere. Soon I faced the challenge of figuring out for whom I’m actually creating graphics and what person got the last say. 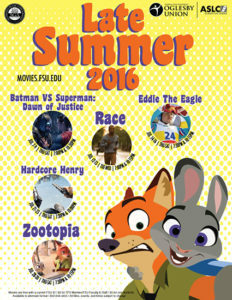 In the midst of all of that, I was given the opportunity to design and create the Late Spring 2016 movie schedule, it was a big goal of mine since discovering the SLC. As I continue my internship, a few other goals come into mind. I plan on keeping up and being on top of my deadlines for projects assigned to me. It is how I earned the chance to create the schedule after being on the team for only a month. Also it keeps me in good standing and gives me more credibility with my colleagues. Time management plays a huge factor in this goal. Next, I desire to enhance my digital skills to the point where I am comfortable using two or more design programs for the same project. The only way to achieve this is through practice and experimentation, which is currently done with our promotional buttons and weekly inspiration assignments. Lastly, I want to be able to defend or explain my process and stand behind my work, since it is has been a challenge for me on a few projects. It’s easy for me to create the work that I’m asked for in exactness, and sometimes other members better receive my perspective on the design. I want to be able to communicate with my team in a manner that allows us to produce the most creative designs possible. Sometimes that means I have to stand by my decisions as a designer or explain why I chose to go a certain path. It is a real-time skill that I will need, and working on it now will help out for future projects as an artist and a designer with the SLC. This internship helped solidify my confidence in my design work as well as making work for the public. It has given me a new perspective on being a graphic designer.